All of East Asia understands and accepts the “modernize or perish” technology imperative bearing down on them. No one needs convincing. To perish is totally unacceptable, so all of East Asia is spending, and spending big, to modernize. And nowhere is the spending bigger than in China. Nowhere is the need greater. Modernization means to automate whatever and where ever automation is possible; modernization means substitute robots for human labor, or at the very least, have many cobots and fewer humans working together. Modernization means the new normal is automation as a way of life. An easy portrait of the need to “modernize or perish” can best be seen in Apple’s $160 billion iPhone business. For every iPhone 7 (2016) assembled by legions of Foxconn workers, China was paid $8.46 per assembled phone. The iPhone 7 would then retail in the U.S. for $649. At the time, IHS Markit reported to Business Insider that the parts in an iPhone cost Apple $219.80. About 13 million iPhone 7s have been sold since 2016. Foxconn’s Zhengzhou factory complex, sometimes called “iPhone City,” employs 250,000 workers. Sadly, as the annual assembly season wanes, upwards of 100,000 workers are laid off until the next assembly season rolls around. FANUC’s Robodrill machines the all-metal casings for the iPhone 7 (and has done so since the days of the iPhone 4). That’s a lot of Robodrills at work for Foxconn. Any downturn in the cellphone biz, as there is these days, must send paroxysms of financial woe throughout FANUC’s balance sheet. By and large, everything in factory-to-the-world China follows this same low-end pattern, and earns the same low-end profit. In an age of disruption, transformation, and automation, that low-end manufacturing existence is unable to sustain China, or any other country in East Asia, or anyone else in any industrialized country anywhere in the world, for that matter. China needs to step up robot-driven automation, and move low-value manufacturing out, hopefully somewhere nearby to maintain complex supply chains and control. Think, ZTE, and why it was so vulnerable to foreign tech. Much of “Made in China 2025” is an effort to mitigate such dependencies with government subsidies, heavy investments in research and innovation, and manufacturing. However, overcoming the enormous, high-tech head start of the U.S., Europe, Japan, Korea, and Taiwan is a formidable task. Is it any wonder that China wants to move up to high-value, high-technology manufacturing? Especially now, since China’s manufacturing-cost advantage over the U.S. has shrunk to less than 5 percent, according to Boston Consulting Group. Modernization means, at first, to use robot-driven automation in manufacturing and logistics, and then later, for everything else. Modernization means, especially for China—trade war or no trade war—shop ‘til you drop! 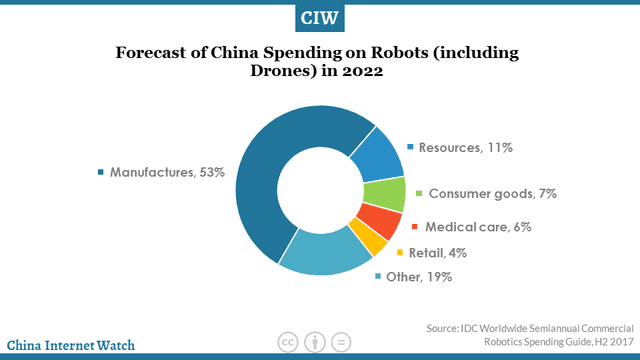 In 2016, China spent $24 billion on robots/robot parts. By 2022, China will be spending $77 billion. Regardless of cellphone and auto sales going soft, with robot purchases in those industries temporarily slowing way down, China’s robot buying spree is still off the charts…and will remain that way. If you’ve got worthwhile automation tech for manufacturing or logistics, get it ready for sale to China. The tremors of massive sales that started seeping across China in the spring of 2017 are now rising in crescendo. Sales of robots, cobots, grippers, AGVs, including parts for all that automation gear has entered boom time…and will continue to boom through 2022. The effects of the massive, twin $1 trillion juggernauts of “Made in China 2025” (begun 2015) and the “Belt & Road Initiative” (begun 2013), are beginning to show themselves in very tangible ways. From ports in Piraeus, Greece, to Hambantota, Sri Lanka, to railroads like the Thai-Chinese railway line that will link Thailand and China through Laos, Chinese hegemony into the ASEAN and west toward India and Europe is creating massive, new supply chains for China’s goods plus massive future profits from loans. A double win. Back home, “Made in China 2025” sees the central government and provinces pouring billions in subsidies into automation equipment, most notably industrial robots, robot parts, and machine-tool equipment. China is by far the globe’s leading buyer of industrial robots (139,000 in 2017). Just entering the mix are cobots and AVGs. China’s getting retooled, in a hurry. That “overall efficiency by 30 percent” will be the holy grail of “Made in China 2025”, as China’s vaunted artificial intelligence tech comes to bear on industrial robots and the factories where they work. Now, even SMEs have landed a subsidy program. Caixin is reporting the National Financing Guarantee Fund Co. is out with a new $9.6 billion package for bank loans to cash-strapped small firms and farmers. China’s State Council has estimated that the fund will provide guarantees on over $73 billion in loans over the next three years (to 2022). All of which means that every factory or warehouse, no matter how small, can now buy subsidized automation. “The establishment of the state financing guarantee fund will support the development of small firms and the rural sector,” reiterated assistant Finance Minister Xu Hongcai. The next three years, through 2022, is a prime selling opportunity for cobots (only 3,000 sold in China in 2017), logistics robots and AVGs for hundreds (yes, hundreds!) of thousands of warehouses; and, even better, for automation vendors to make new, trusted relationships with the massive small-company engine that will drive China’s future. This is nothing short of a totally unprecedented move by China to retool the country from the ground up. The three years to 2022 are also important because in 2022 it’s time again for the next people’s congress (the 20th National Congress) at which Xi Jinping has got to make face big time before this all-important national event. Plus, the previous February, Beijing will host the 2022 Winter Olympics (construction is well underway) during which the entire country will be under the media microscope. 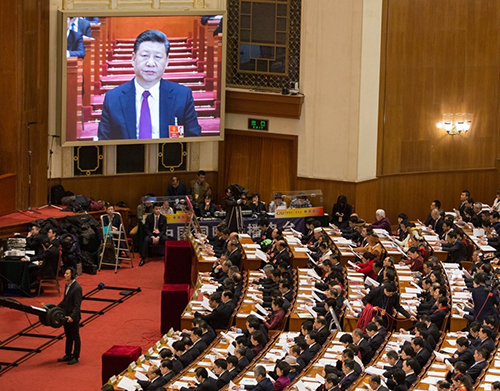 In 2014, Xi put his personal stamp of approval on the country’s “robot revolution”, and 2022’s 20th National Congress is his national stage to show how he’s shaped and formed that revolution to better the country. 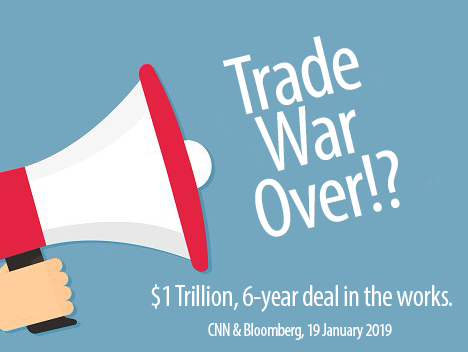 With automation equipment so critically needed, U.S. automation suppliers will, most likely, never have to bear the brunt of a profit-stealing tariff. EU vendors, many with established partnerships in China, as well as the Japanese and Koreans and their Chinese partners, are also in for a very large payday. While “Made in China 2025’s” other lofty goals, like a world-class microchip fab or self-driving cars, are a lot further out than 2025, the robot revolution is a clear and present victory for the country. It’s there and highly visible, and as such, as much as possible of it will be put on steroids to show the world. For East Asia, especially China, automation is now a way of life.